Check out this very nice 1995 Godzilla Painting which was created entirely by the acclaimed Science fiction artist: Chris Scalf! 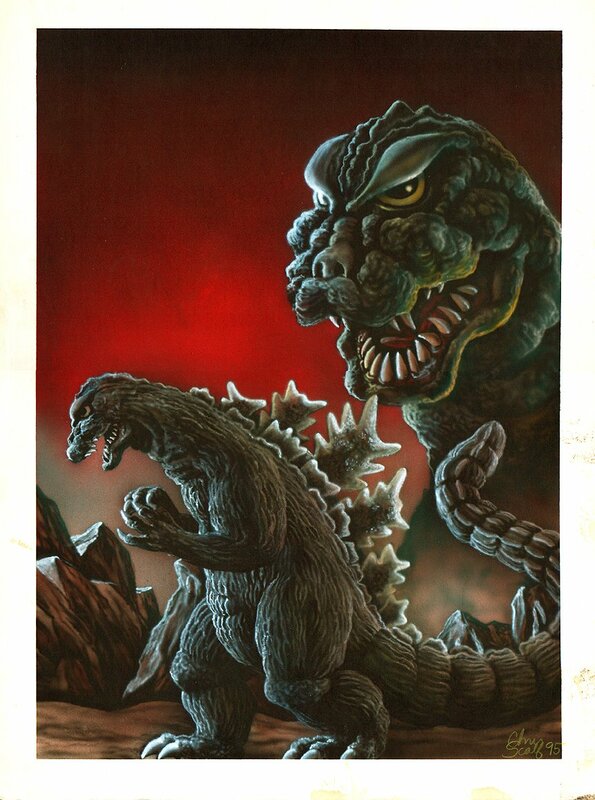 Godzilla is pictured in a classic pose from a scene from when he battled Monster X, (King Ghidora) This mixed-media large "monster-piece" has a LARGE PAINTED image area of 12.75" x 18.5" on 15 by 20 inch thick Crescent art board, and the art is in Excellent condition. The art has production notes on the back, and artist Chris Scalf personally told me this painting was published as a pinup or cover for G-FAN magazine, which is like a FAMOUS MONSTERS type magazine. This is sure to make a treasured showpiece for fan-addicts of the Godzilla movies! ALL art on our website (including this one) are able to be purchased with VERY fair time payments, and trades are always considered towards "ANY" art on our website! Just send us an email to mikeburkey@aol.com and we can try to work something out.